Southwestern starwort is a tiny short-lived perennial aquatic or semi-aquatic species found primarily in North America in the western half of of the United States and one Canadian province (British Columbia) (USDA 2011). In British Columbia, it is found in wet ditches, mudflats and shallow ponds and shorelines in the lowland, steppe and montane zones, where it is rare in extreme SW and SC BC (Douglas et al. 1999). 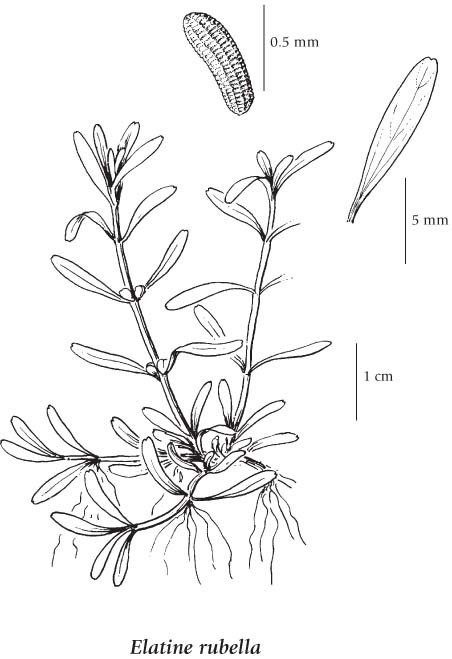 Annual or short-lived perennial, aquatic or semi-aquatic herb; stems prostrate to erect, 3-10 cm long. Opposite, simple, oblong-lanceolate, short-stalked, tips blunt to notched, 0.8-1.2 cm long. Inflorescence of 1 or 2 axillary flowers per node; petals reddish, 3, widely elliptic; sepals usually 2; stamens 3, opposite the sepals. Capsules, 3-chambered; seeds narrowly oblong, straight or slightly curved, pitted in longitudinal rows. Wet ditches, mudflats and shallow ponds and shorelines in the lowland, steppe and montane zones; rare in extreme SW and SC BC; E to NB and S to MO, VA, TX, NM, CO and CA.